The corner of Battery and Broadway in downtown. It's summertime and that means it's time to jump back in the saddle. For the fifth time, I'm beginning my two-week stint as an MMJ reporter/videographer at KPIX TV, the CBS O&O in San Francisco, my employer before I began teaching at Newhouse at Syracuse University in 2011. I hope to catch up on how this big-market TV station is using social media, drone technology and other storytelling tools to relay what's happening in the community it serves. Check back here for updates on what I'm learning and details about the hurdles overcome and satisfactions enjoyed in local television news. 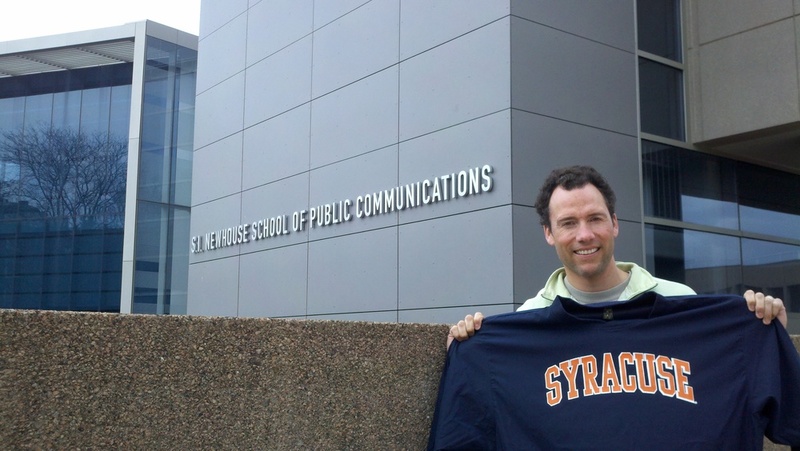 My goal is to help Newhouse Broadcast and Digital Journalism students get a taste of what their careers might be like. The flight from SYR to SFO is dedicated to brushing up on Edius video editing software. We use Adobe Premiere at Newhouse, so it helps to remind me what's different. I download a bunch of video tutorials to my iPad and watch them on the way out. Watching the terrain change during the flight across the country makes it worth getting a window seat. I'm iffy on the first two: Nebraska; Utah; Modesto, CA; San Jose; South Bay salt ponds; San Francisco Bay. Of course, arriving back in San Francisco reminds me of my claim this is the most beautiful city in the world because it's got the best combination of natural and man-made beauty. Right? Thanks to the bosses at KPIX who make it possible for me to see if I still can.